After visiting the Dolphin Research Center, Eileen McDargh became fascinated with the corollary between employee engagement and high performance in the watery world. This is what she learned. Who can resist the constantly “smiling” face of a dolphin whose intelligence and acrobatic skill have delighted humans for centuries? Whether through the legends of sailors rescued by these marine mammals or through frescoes found on the walls of ancient Minoan palaces, humans continue to be intrigued by dolphins. I am no exception. Nor is my 13 year-old granddaughter Siena. Together, we showed up at the Dolphin Research Center (DRC) where a colony of Atlantic bottlenose dolphins call the lagoons of the Gulf of Mexico home. Here, DRC researchers and trainers care for dolphins who have to come to them because of injuries or because prior captivity deemed them “non-releasable.” The Center is a not-for-profit education and research facility dedicated to promoting the coexistence between marine mammals and humans and the environment we share. Through research and education, we begin to understand the world of the dolphin and can study cognition, physiology and husbandry. As a management consultant, I became fascinated with the corollary between engagement for high performance in order to create a resilient organizational life and engagement and high performance in the watery world of the dolphin. Lesson #1: Know everyone’s name and something unique about each one. DRC, researchers tell dolphins apart by their coloring, their movements, and call each by their name. A special shape on a stick is lowered in the water and every dolphin knows which one belongs to him or her. In organizations, I’ve observed managers who do not know the names of their employees, can’t tell you one thing unique about them, and send group messages that don’t take individuality into account. This anonymity is compounded in a virtual world. Sadly, that virtual world becomes the fallback way of communicating even if the person is sitting in the next cubicle. A great manager/leader knows that every virtual team must at least start with a face-to-face meeting (or video face-to-face) and a personal sharing of more than resume data. A great manager/leader finds ways to highlight each person so they feel singularly recognized. At DRC, researchers and trainers make sure that before asking a dolphin to do something “more”, they have allowed the dolphin to be successful in a current task. When the new “request” is made, the trainer makes sure that not every element is strange and so there’s a modicum of comfort. In organizations, goals are sometimes changed before employees have a chance to experience and celebrate success. The bouncing ball is never caught. Frustration results. Likewise, when responding to the demands of a changing business world, a great manager/leader makes sure that at least some element of prior success is brought into play. For example, Apple used the technology of the I-Phone to create and expand into the world of the I-Pad. At DRC, researchers and trainers break apart a task or a research project into smaller components and observe dolphins while adding the next step only after seeing successful completion of the first. Different dolphins also learn at different rates. In organizations, great managers/leaders don’t expect 100% proficiency from the starting gate. Instead, they watch for building blocks of performance. By observing and listening for such blocks, a manager/leader also knows whether an employee can, in fact, do the assigned task. That manager/leader must also know what is the time frame for accomplishment. Not everyone is suited for specific tasks. Pulling the plug too late can be as dangerous as pulling the plug too soon! At DRC, some of the dolphins were stronger and quicker than others. Dolphin Tanner would become bored if not offered enough stimulation. He loves the cognitive challenge of imitating while blindfolded with soft latex cups. (International Journal of Comparative Psychology, 23,671-688). Without stimulation and challenge, Tanner “checks out” of his work. Organizationally, humans are no different. Skilled performers become bored and apathetic if not invited to explore what might be the next growth opportunity. A great manager/leader watches for performers who have “checked out”. Increased stimulation might be just the answer. 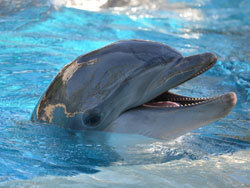 Dolphin Talon is a grandchild of Flipper, one of the stars from the television show by the same time. Talon literally squeals with excitement every time he makes an incredibly high jump and puts an extra rotation into his flip. Dolphin Calusa is a jokester, hiding the target poles so trainers have to ask her to go find them. And Molly is my special “dolfriend.” Yes, I adopted this 50 year-old older marine mammal with scars from a former life under her flippers. She is into accessorizing and has a collection of colored scarves that people have brought her! When Siena gave Molly the command to “Bring me a gift,” Molly came back with an orange and red silk scarf over her snout. Siena was thrilled. We learned this does not happen often. Molly has been known to suddenly appear with a scarf over her dorsal, one on her nose, and another on her flipper. And to this day, divers who inspect the lagoon have NO idea where she hides her accessories! We are all like the dolphins, wanting to add some color, fun and personality into our workday. A great manager/leader makes space for humor, laughter, and originality of expression. In fact, it is the laughter and spontaneity that keep researchers, trainers, and the many volunteers at Dolphin Research Center coming back for more. As we drove back to Miami and our long flight back to California, Siena and I realized we had laughed and learned. We watched with wonder. And we knew that places like the Dolphin Research Center allowed us to also embrace our own humanity. Eileen McDargh is a Hall of Fame professional speaker, management consultant, resiliency expert and top thought-leader in leadership. © McDargh Communications. Organizational Culture – Help or Hindrance? Next article: How Real Are Those Price Pressures?